Intimate dining in a French-inspired café in Mid-City. Lunch Wed.-Fri., Dinner Wed.-Sun., Brunch Sat.-Sun. About the restaurant: The memory of French Impressionist Edgar Degas is alive and vibrantly respected in this stalwart neighborhood café, frequented by both neighbors and tourists from all over the globe. 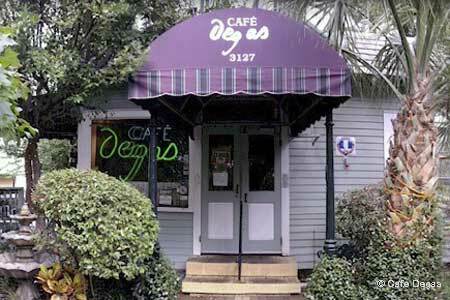 Situated curbside on historic Esplanade Avenue, Café Degas feels like a Parisian sidewalk café, except it is covered. Likes: Savory crab and andouille sausage cheesecake. Food & Drinks: Diners sample the authentic salade niçoise, tender mignonettes of veal Parmesan and pan-seared rack of lamb with lamb sausage. Every meal at Café Degas should begin with the comforting warmth of the house French onion soup. Brunch is best enjoyed slowly, beginning with a pâté or cheese board, and the crab omelet. The chef even tips his hat to New Orleans with grillades and a variant of the low country's Hoppin’ John using stone-ground grits in place of the traditional rice. The diverse American and French red and white wines are surprisingly sophisticated for such a small café. Pastries offer a good reason to stay awhile, but the lavender honey ice cream is a must.